It looks like she’s peeing in the water cooler.. lmao. Thank you Gina! That was my first thought! I’m so glad I’m not the only one!! That is sooooooooooo freakin wrong! 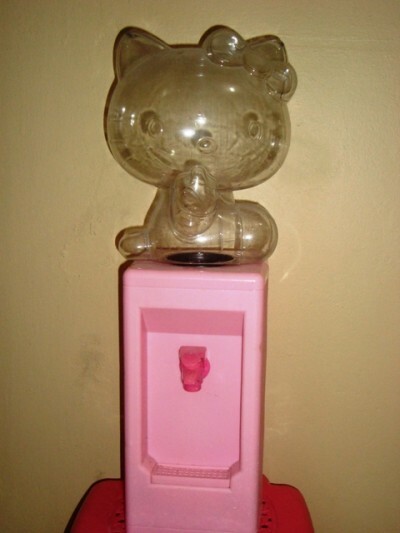 I was given a HK water cooler for Christmas, but it wasn’t shaped like that. Taking a look at it, I realize the one in the two-pack simply has a ‘normal’ cylinder on top for the water. And of course, It’s not a ‘cooler’, just a ‘dispenser’ in either case. No, you’re right; it IS cheap and leaky. I was given the regular (bottle topped) version for Christmas several years ago and I just sold it at a yard sale for $2. I never used it after Christmas Day! LOLOL. it does look like HK is peeing…I LOVE YOU HOLA GATO!! That’s where they sell them along with a microwave , a mini fridge, and little sweeper.